Tanzanians are warm, loving, intelligent people who live in a difficult undeveloped environment lacking in infrastructure, food security, water resources, monetary resources, technology and many other things that we take for granted when living in a developed nation. Each day can be a struggle just to get to the next day. Simple Hope evaluates what conditions are keeping a group of people from moving forward in their sustainability. Then projects, resources and programs are tailored to their specific need. We believe in working long term with a few groups as opposed to moving about to many different areas. We have been working consistently with the Hadzabe tribe of Lake Eyasi, The Tumaini Group in King’ori and the children at Mantonyok Orphanage since 2011. These groups continue to be our focus. The greatest initial need that we found in all cases, was stabilizing their nutrition so that they had the energy and ability to learn new skills. To do this, over 700,000 rice based meals were packaged by volunteers in the USA and container shipped to our project sites in Tanzania over the course of 6 years. In tandem, sustainability education to teach how to become food secure also began. In 2017, shipment of the rice meals ended as it became evident that the sustainable projects are working and shipping became much more expensive. Any supplemental nutrition needed will now be purchased in country. In general, we, as co-founders do most of the teaching, bringing information learned from experts in the various fields. 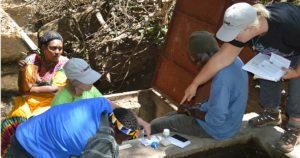 We use Tanzanian help and knowledge whenever possible. On occasion, teams of people have traveled to teach with us when we needed several people to provide hands on help. For example, in 2012, nine volunteers traveled with us to teach the Hadzabe people how to make bricks. 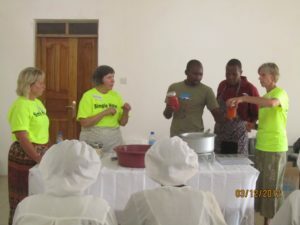 Seven volunteers helped us run a food preservation seminar in King’ori. Other times a few experts in their field traveled with us when we began a new project. For the most part, however, it is the Tanzanians that accomplish the work, not mission teams, as we want them to learn and practice the skills and understand that they can grow their own nation. Further, we always work in conjunction with the Tanzanian government, making sure that they are on board with our project ideas and progression. In all projects, it is important for those receiving help to be fully involved in each step of the process. For the Hadzabe to receive daily nutrition, they had to help build a storage facility to keep the rice meals safe and dry. They came together to make the bricks for the construction and cleared the land of large rocks and boulders to make a road. We knew that if they accomplished these tasks, they would be motivated to learn new things going forward. In the USA, we try to tell the story of what keeps Tanzania, as an undeveloped nation from moving forward quickly. Unfathomable things such as “the rains have brought the water buffalo in and now it is too dangerous to go to the local water source” are common types of comments we hear Tanzania. It is hard for us to comprehend when we can just turn on the faucet inside our home. The more we know and understand the small details of our world, the more love and compassion we can have for those whose lives are difficult daily. Of course, none of this would be possible without the divine help from God. We prayerfully depend upon His direction and resources. He has connected us to people in unusual ways, brought financial resources from unlikely places and opened many hearts to know the Gospel through the process of lifting those who struggle in Tanzania.